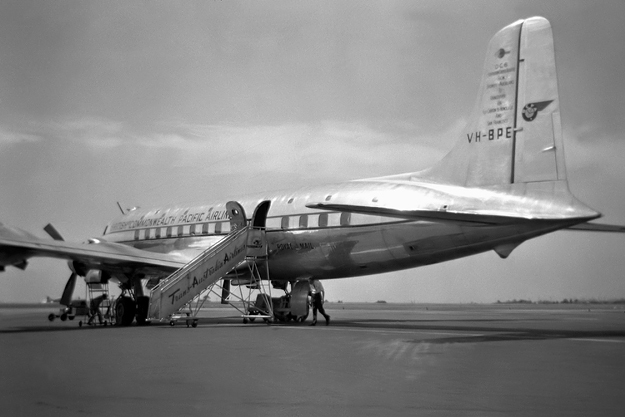 British Commonwealth Pacific Airlines (BCPA), was an airline formed by the governments of Australia (50%), New Zealand (30%) and the United Kingdom (20%) to operate 'British' trans-Pacific air services linking Australia and New Zealand with Canada, principally in competition with American airline Pan Am. BCPA was registered in New South Wales in June 1946 with headquarters in Sydney. Its original route was Sydney-Auckland-Fiji -Canton Island-Hawaii-San Francisco-Vancouver. Services included Melbourne from 1953. Initially BCPA had no aircraft of its own and so chartered all flights from Australian National Airways (ANA), which used its Douglas DC-4s. The inaugural service departed from Sydney on 15 September 1946. Click on the brochure/timetable image at right to download a full copy of the brochure as a .pdf file. This brochure was printed in Canada in 1947. Also, click here to see a 1947 Equator-crossing card from the ANA-BCPA service. 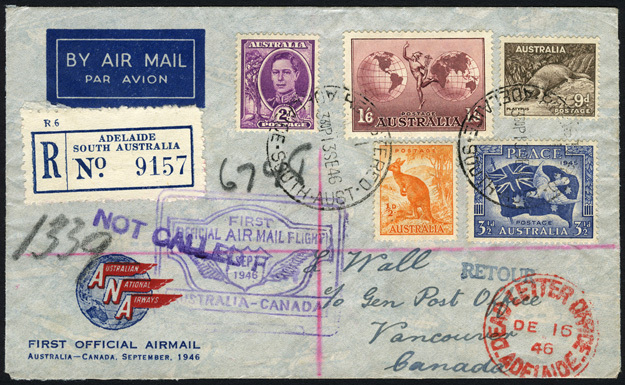 The letter below was flown Australia-Canada on the inaugural trans-Pacific service operated by ANA on charter to BCPA. The service was operated by Douglas DC-4 VH-ANC Warana. It departed Sydney on 15 September 1946 and routed Sydney-Fiji-Canton Is-Honolulu-San Francisco-Vancouver, arriving on 18 September. 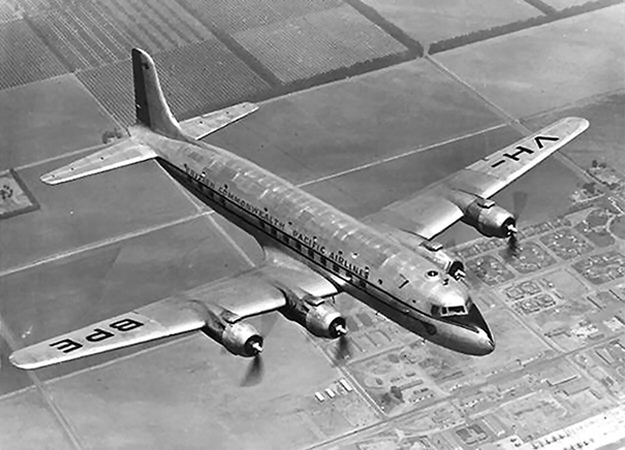 In late 1948 BCPA took delivery of the first of four Douglas DC-6s, fitted as sleepers. Each aircraft was named for one of the four vessels of Captain James Cook: Resolution (VH-BPE), Discovery (VH-BPH), Adventure (VH-BPG) and Endeavour (VH-BPF). 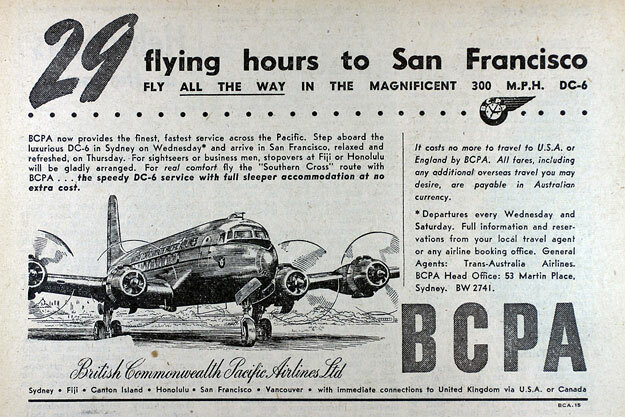 The DC-6s enabled BCPA to introduce pressurised services on the Pacific ahead of rival Pan Am, as the advertisement at the bottom of the page shows. 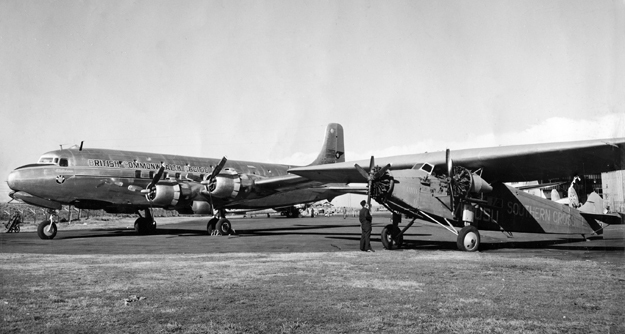 On 16 September 1949 Kingsford Smith's famous Fokker F.VIIb/3m VH-USU Southern Cross, which was at that time in storage at Sydney/Mascot, was wheeled out for a photo opportunity with BCPA's new DC-6 VH-BPF Endeavour. Just 21 yearsof aviation development separated the first air crossing of the Pacific from BCPA's new scheduled DC-6 service. BCPA named their service the Southern Cross Route after Smithy's great achievement. Above and below: Another of BCPA's DC-6s, VH-BPE Resolution. The image below is at Melbourne/Essendon. Sadly, VH-BPE Resolution was lost with all 19 on board, including American pianist William Kapell, when it crashed while on approach to San Francisco on 29 October 1953. This accident marked the beginning of the end for BCPA and its operations were taken over by Qantas the following year. The photo below shows BCPA pilots First Officer T.P. 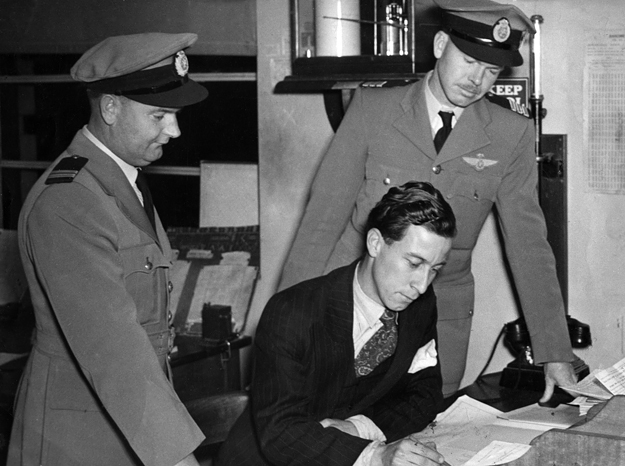 Fairway and Captain J. Pessey consulting with the meteorologist in the Briefing Office at Sydney/Kingsford Smith airport prior to departure for America. The name of the meteorologist is not known at this time, however the same gentleman appears in the DCA film Flight Plan, made in 1950, which provides a date guide to this image. 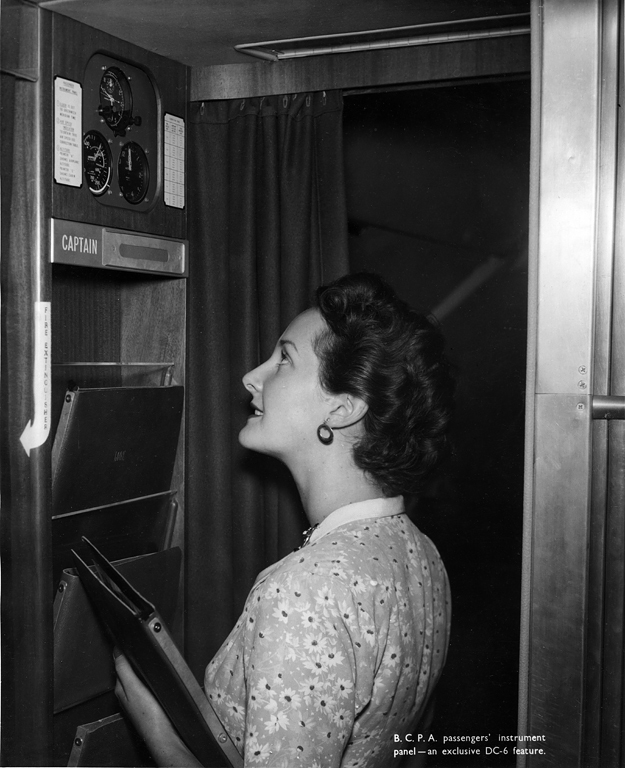 The pressurised DC-6s were fitted with the latest equipment, including radio navigation aids. Nevertheless, navigation on the oceanic parts of the route was done primarily by astro - that is, using star sights. 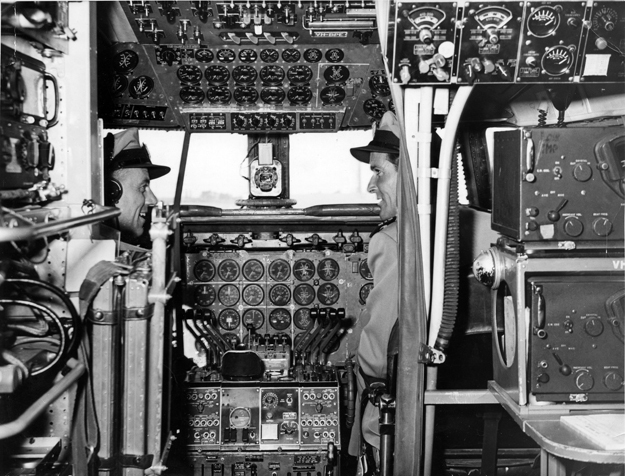 The photo below shows the mass of instruments in the DC-6 cockpit. Besides the pilots, the technical crew included a navigator, a radio officer and a flight engineer. 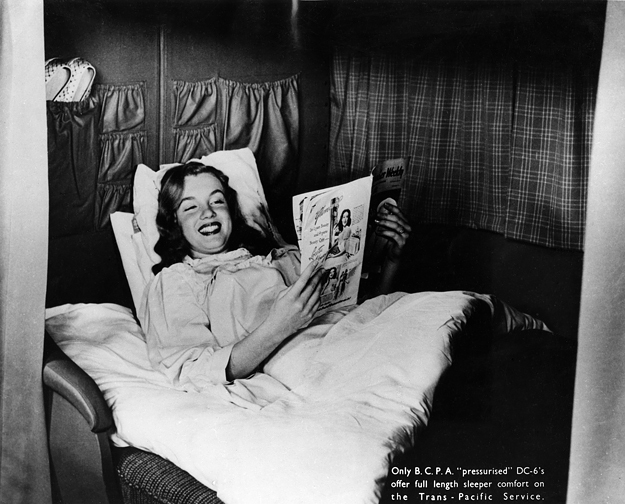 The DC-6s introduced a new level of comfort for passengers. 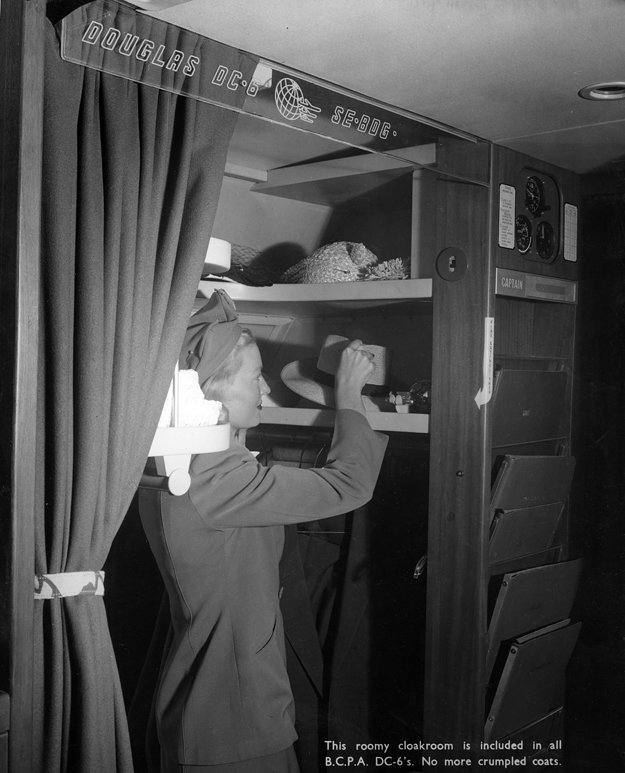 The publicity photo above shows the aircraft's cloakroom, while the image below shows a set of instruments for passenger reference mounted on the bulkhead adjacent. The top instrument is possibly a clock, while those below are an airspeed indicator and altimeter respectively. The perspex sign in the photo above states the aircraft to be SE-BDG. The BCPA aircraft were built for Scandinavian Airlines System (SAS) andallocated a Swedish registration, althought they were not operated and instead were put into storage with Douglas at Santa Monica. They were a good buy for BCPA as they could be purchased without using US dollars, which were tightly restricted at the time. SE-BDG became VH-BPE Resolution. 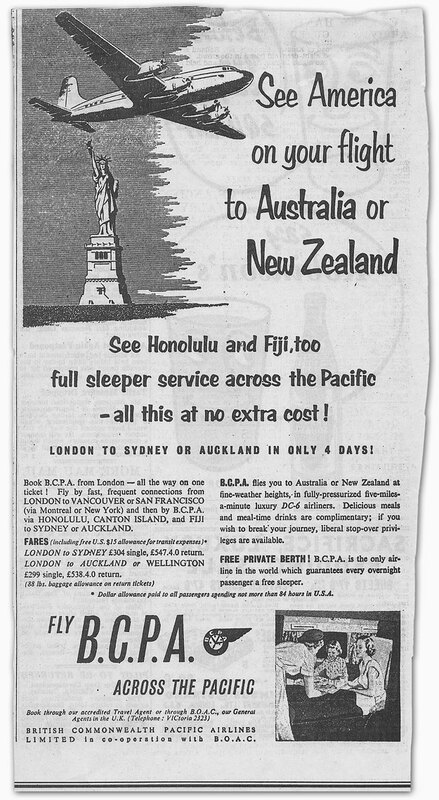 With the long over-water legs of the Pacific service planned at night to facilitate astro navigation, the sleeper service offered by BCPA was no doubt very welcome to its passengers. As shown above, the seats could be folded down to make a lie-flat bed, something that would not make a re-appearance on the Pacific for many, many years! In common with most other intercontinental airlines of the day, BCPA gave its passengers a card celebrating the crossing of the equator. 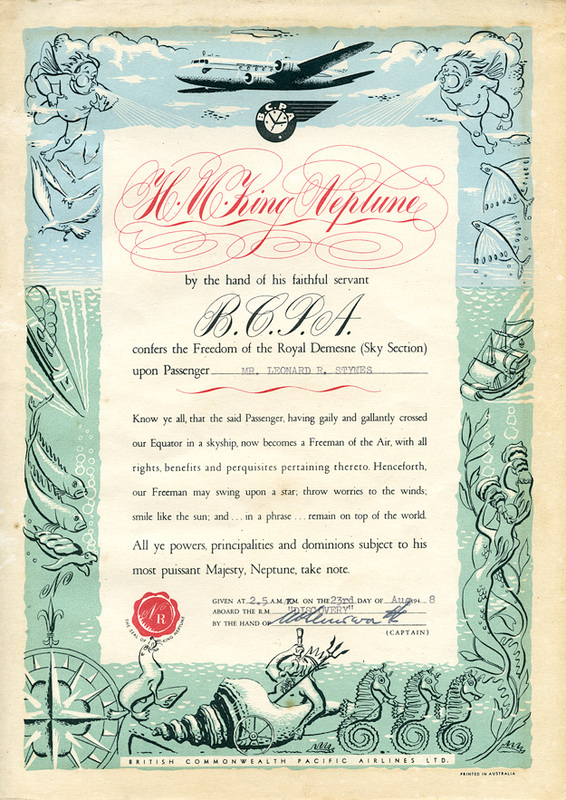 The card below dates from 23 August 1948 on board VH-BPH RMA Discovery. 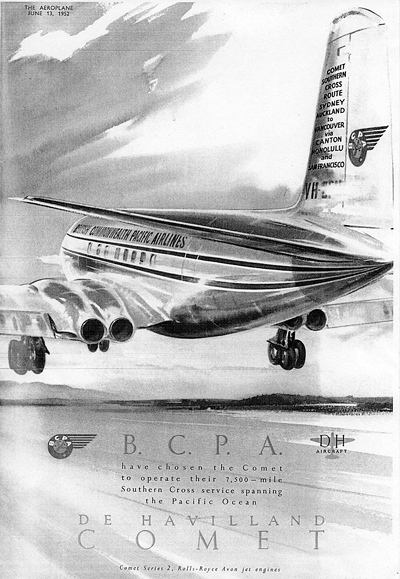 BCPA had ambitions to move into the jet age, as the advertisement below from Aeroplane magazine in June 1952 indicates. The de Havilland ad states that "BCPA have chosen the Comet to operate their 7,500 mile Southern Cross service spanning the Pacific Ocean." However, it was not to be: Qantas took over responsibility for trans-Pacific services on 1 April 1954, although services continued to be operated by BCPA DC-6s until 15 May. The remaining three BCPA DC-6s were then sold to the New Zealand airline Tasman Empire Airways Limited (TEAL - later Air New Zealand). Qantas initially used Constellations until their Boeing 707s entered service in 1959.